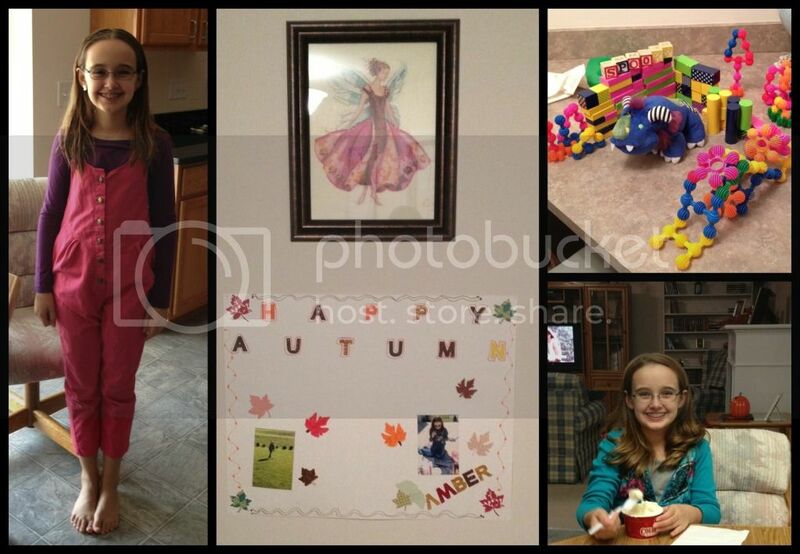 This week was part two of our "getting projects completed" Fall break. We still had school, just a lighter load and did a lot of project based items. Some for Amber, and some for me. It was a fairly busy and hectic week, but we accomplished almost everything that NEEDED to be done. My personal to-do list is still quite lengthy and even divided into three different lists, based on priority. However, the most pressing items have been removed and I can breathe again. Religion - Still using Egermeier's Bible Story Book. Still loving it again. We are returning to our normal curriculum next week. But we will find a way to incorporate more of the Egermeier's book. Math - Still plugging along using Saxon 7/6. She even had a test this week (and a perfect score!). Reading - we were back to the normal reading curriculum this week, but finished up more King Arthur tales for literature. Next week we will take a break from literature and have both Reading and Grammar. Social Studies - We started our Election study this week, and Amber has been enjoying it immensely. This one is really a big hit for her, which good because we have four weeks of the election study to complete and have only finished week one. We have found a lot of the links provided in the study are broken, which is making it more difficult than it needs to be. I'm a little disappointed, especially since this is a recent publication just for the 2012 elections. That was it for the strictly academic part of school this week. Still, that is pretty good for a "Fall Break / Project week". In terms of projects, we finally finished painting those built-in bookshelves last week and then loaded up our pretty green bookshelves on Monday. That also meant I had to haul the old bookshelves to the pit of despair basement. Our loft room is so much more functional now and we know where all the school related supplies and books are located. I'm so giddy and I keep finding reasons to go look at the newly organized room. We managed to switch all of Amber's clothes around to her fall / winter wardrobe early in the week, just in time for it to warm up a bit. Of course, the weather always does that. Still she now has easier access to her cool weather clothing and some access to her warm weather clothing. Now, if I could just do the same with my closet. I did at least get my shoes switched around. Yay! (left) Amber found an old Osh Kosh overalls that had once been my sister's beloved outfit. Amber is enamored too. (middle) Amber's Autumn poster is coming along. We have more pictures to put up still. (top-right) Amber built a "castle" for her latest Webkinz and has been perfecting it all week long. There are many features and additional inhabitants now. (bottom-right) Amber enjoying a treat last weekend. She actually let me curl her hair that morning. This is what it is supposed to look like. Amber finally had time this week to paint her acorn people. She has been looking forward to this project for over a week, but the weather and our available time just never worked out. This is a cute little project that we saw on the Homeschool Girls blog and Amber just had to try it out. So, Wednesday we headed out to the driveway for a fun afternoon of painting. I set her up with all the supplies she needed and she went to creating while I worked in the garage. Thanks to the weekend we spent laboring in the garage last year to epoxy the concrete floor, all I had to do this year was a little sweeping and hosing down of the garage floor. There wasn't much to tidy or clean out since every last item in the garage had to be removed for the project last fall. After an hour or so of painting just three acorn people and quite a few colorful, glittery leaves, Amber was "done" with that project. Squeegeeing the garage floor looked like more fun to her. My child is strange. I let her have a go at that, then we played some soccer while waiting for the floor to dry sufficiently to return the bulky items to the garage. Amber and I also had our much needed hair cuts on Friday, so we no longer look like worn out mops. Unfortunately for me though, my salon style didn't last long Friday. I power washed the driveway before our appointment and then spent three hours (!) 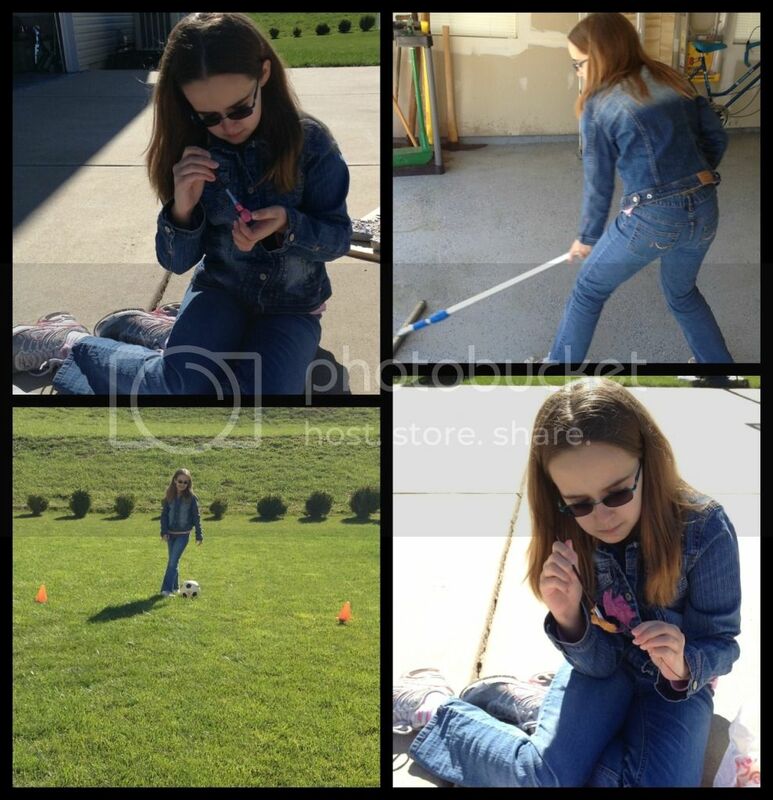 sealing the driveway after our hair appointment. It's about this time of year that I curse the driveway that we otherwise love. Side entry garages with the turnaround pads do not make for a happy time when sealing all that concrete. Needless to say, I've been a bit achy since Friday. Among my smaller tasks finished this week, I completed Amber's Halloween costume, finally. Finding the time to just sit and sew is harder than I thought it would be this time of the year (or any time of the year). I also started the beginning stages of my costume. It may require me to have another day of "light school" in a week or so in order to finish my costume on time. Pictures will come, but probably not until Halloween. We are still spending a lot of time at the dance studio for Amber, and I'm doing a little volunteer work for them too. This week seems to have had a lot of dance focus for Amber. She is a little concerned about remembering all her dances because this is the first time she will be in the "spotlight" at recital. Even when she competed in dance, she was part of a group. This semester she has a solo dance (Jazz), a duet (lyrical), a trio (tap), a quartet (jazz again) and then a group ballet dance. She has been spending a fair amount of her spare time practicing in the basement. It's been a long time since she practiced dance at home. Amber also found a Christmas dance costume (far left pic) at the resale that we had to buy because it was just too darn cute. She has no need of it right now, but it is a little big and she can just arrange for her solo next fall to be a Christmas dance. Amber's sparkly top for her solo dance arrived this week too, so there was a lot of fun trying it on and putting on a show with the outfit. We still aren't sure about the pants (far right pic). She may end up with capri pants for the dance. It is a jazz dance and the hat is actually a prop for the dance itself. 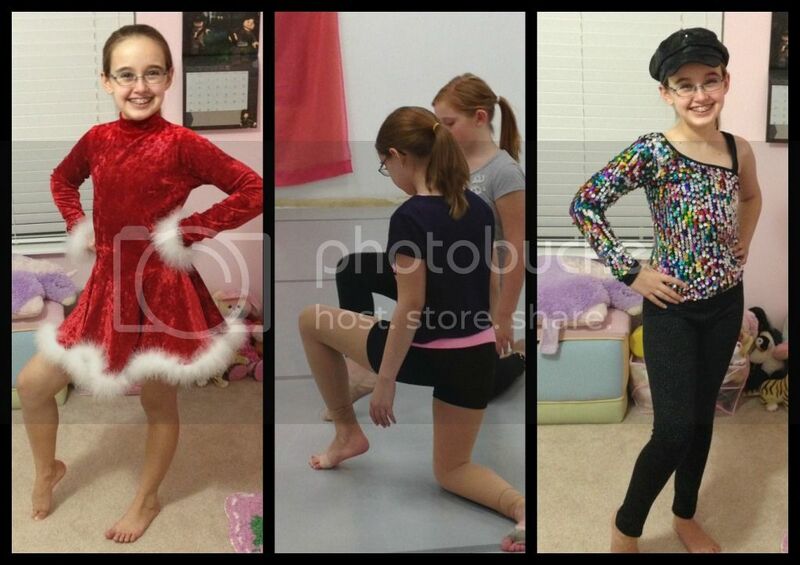 The middle pic is the starting position for Amber's lyrical duet. The dance is coming along VERY nicely. That picture was supposed to be video of the dance, however I'm phone impaired by the time lyrical class comes along and only got a photo of the starting pose. Still, from what we've been told, the girls are doing phenomenal in their dance. Next week we are trying to return to our normal school schedule, however there are a few projects and appointments remaining that may make it a somewhat lighter week than normal. I loved reading this post Christy. What a bunch of fun, learning, dancing kinda things you did. 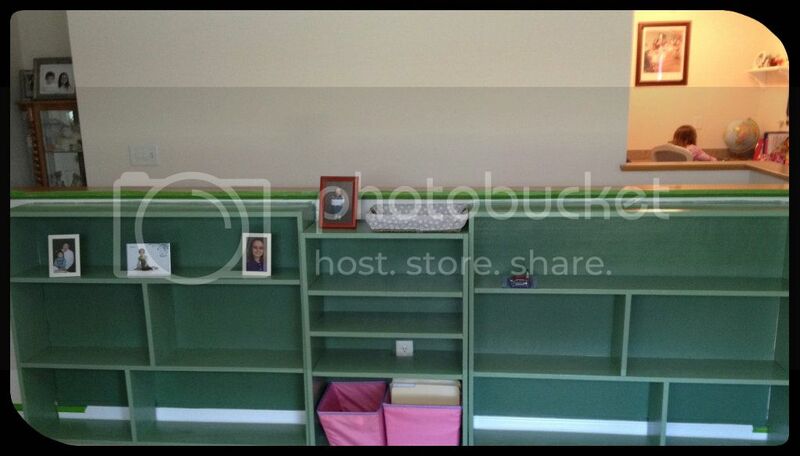 The bookcase looks really good! So glad she got to do some acorn people. How exciting about her big dances. Love the Christmas outfit. Keilee loves buying stuff like that at thrift stores and wearing it around.